Art & Observations: The Bounty Hunters that did not make the cut. The Bounty Hunters that did not make the cut. Rejected Bounty Hunters: 11 x 8 inches, Graphite, Pen, and Digital texture. Finally and triumphantly, I complete another ChaDes Challenge. It has been along time but I think I made up for it in effort. The Challenge was to design characters that were rejected by the Galactic Empire to be hired as Bounty Hunters. See the challenge here. 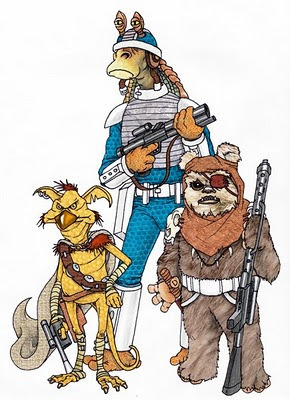 I found these characters to be some of these least threatening and goofy characters in the entire Star Wars Universe. Thanks for stopping and, if you get a chance, please tell me what you think. Awesome! Please submit this to threadless, I'd love to have this design on a t-shirt. I recognize all of those blasters, haha. I was considering that...I just may. This is the kind of thing they like in the Treadless community.